It's been a while since I've had a good steak. The same cannot be said about Bloggery media rep DanDan who got to swing by a special tasting of the new summer menu at Fleming's recently. Here's what he had to say. I recently had the opportunity to try the new summer classics menu from Fleming's. Nestled amongst some of the top restaurants in Boston, is this community gem. While they're well known for their potatoes (which this diner can highly vouch for the quality of), they stake their reputation on, well, their steaks (pun intended). As with any top-notch steak house, the also have excellent seafood as well. So as not to rest on their laurels, their new menu introduces some tasty new appetizers and dishes, including two new steaks. 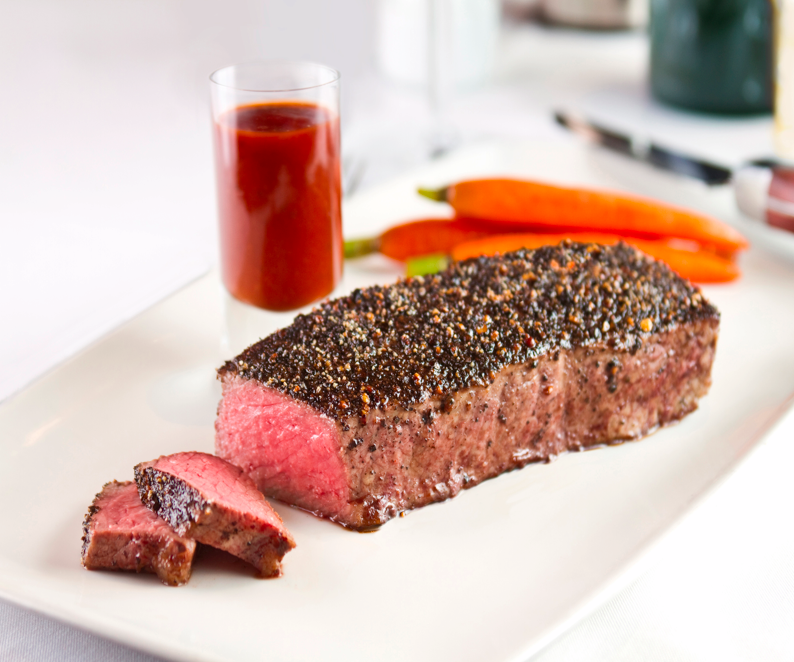 The first steak I tried was their peppercorn steak, which was a prime new york stripped seasoned with cracked black and white peppercorns and a proprietary "F17" sauce on the side. The complex flavor of the sauce, served tableside by a separate waiter, was quite surprising! While the steak tasted great on its own, the sauce added a unique flavor and enhanced the spice of the peppercorn. I would definitely recommend trying it with the sauce and without. The other steak I tried was the porcini rubbed filet mignon, served with a gorgonzola cream sauce. This was definitely my favorite of the two (albeit, delicious) steaks. The gorgonzola sauce was a perfect compliment to the perfectly cooked meat. Both meals were served along with wonderful sides, and I would highly recommend a visit to anyone interested in a fine meal. An interesting side note, while there, I found out that Fleming's has a daily appetizer special. Select appetizers (including their tenderloin carpaccio, the sweet chile calamari, their wicked cajun barbeque shrimp, their seared ahi tuna, their jumbo lump crab cakes, and their Fleming's prime burger) are only $6 before 7pm. I've had the jumbo lump crab cakes, and even at regular menu price, they're well worth it. Beantown, looks like we've got a new place to go for a cocktail after work! I agree wholeheartedly - an after work cocktail and a steak. You're buying. 0 Response to "New Summer Classics Menu at Fleming's"